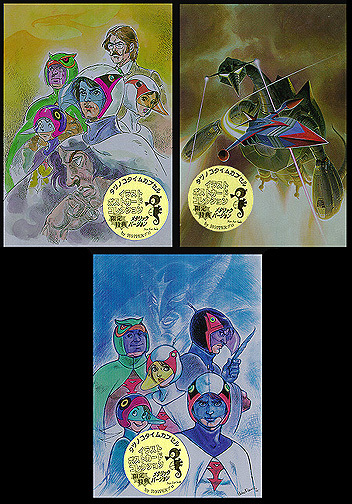 Information: These were special promotional versions of past "Gatchaman" postcards. They were not sold, but given away if a buyer purchased a certain amount of Tatsunoko Time Capsule postcards. Each card was printed with special metallic inks, and each were packaged individually in resealable plastic bags. They also included special stickers denoting the fact they were special editions. As pictured above, the cards were illustrated by Sadao MIyamoto (top, left and bottom) and Mitsuki Nakamura (top, right).